In the past few years, lawmakers and health officials in Texas have been paying close attention to the state’s rate of maternal mortality, which is when women die during childbirth or shortly after having a baby. "What we tried to do in this study was to look at how often mom’s get into trouble, not necessary dying… during their pregnancy," said Dr. David Lakey, a professor of medicine at UTHSC Tyler and a former Texas state health commissioner, who contributed to the study. Compared to maternal deaths, Lakey said, the instances of women almost dying is much higher. According to the study, "between 2011 and 2016 in Texas, the overall rates of severe maternal morbidity have remained consistent, fluctuating between 17.0 per 1,000 deliveries at the low end and 19.9 per 1,000 deliveries at the high end." The rate of maternal mortality in the U.S., for comparison, is 18.0 maternal deaths per 100,000 live births. "Maternal deaths are just the tip of the iceberg," said Dr. Meliha Salahuddin, an instructor at the Department of Community Health at the University of Texas Health Science Center at Tyler. "What is more common, unfortunately, is severe maternal morbidity." Salahuddin, who also contributed to the study, said instances of women having medical complications are about a hundred times more common than maternal deaths. However, much like maternal deaths, she said, there are also significant racial and ethnic disparities when it comes to severe maternal morbidity. Researchers found black women were roughly twice as likely to experience severe maternal morbidity in Texas than white women. "What we found was it depends on who you are and where you live on the rates of and your chances of having severe maternal morbidity in the state of Texas," Lakey said. 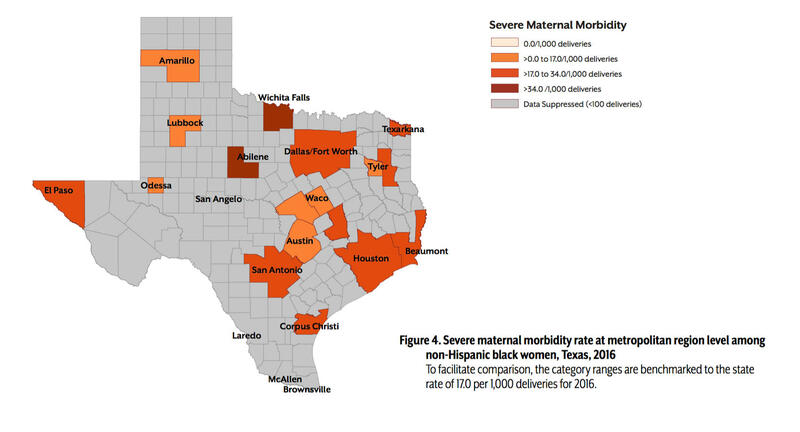 In 2016, the study says Texas' severe maternal morbidity rate was highest among non-Hispanic black women, with 23.8 per 1,000 deliveries experiencing serious complications. Hispanic women were also more likely to experience medical issues while giving birth compared to white women. Researchers also found disparities between different parts of the state. At the county level, they found that, among counties that had at least 100 deliveries, more than a third had a severe maternal morbidity rate that was greater than the statewide average. Another 7 percent of the counties had a rate that was more than double the state’s rate. Salahuddin said one of the main goals of the research was to get "a lay of the land" to see how severe maternal morbidity was distributed across the state. "Our work is actually just the first step of trying to understand what the distribution of severe maternal morbidity [is]," she said. When researchers drilled down to the ZIP code level, they found some metropolitan areas consistently had the highest rates of severe maternal morbidity year over year. According to the study, those ZIP codes were primarily located in the Dallas-Fort Worth-Arlington, Houston-The Woodlands-Sugar Land and the San Antonio-New Braunfels metropolitan areas. However, they also found that some areas had consistently low severe maternal morbidity rates. Those ZIP codes were predominantly located in the Austin-Round Rock-San Marcos, El Paso, and Amarillo metropolitan areas. "The next steps are to understand why are some areas of the state doing better consistently and why are some areas of the state are doing worse consistently," said Dr. Divya A. Patel, an assistant professor with the Department of Community Health at the University of Texas Health Science Center at Tyler. Patel said there is likely a lot to learn from the areas of the state that have had low rates for many years. "And that’s really where the value of the data are in terms of using that information and sharing with other places to say, you know, 'How can we improve the quality of care that women are receiving?'" Patel said. And Lakey said there is a cost to a community for every maternal death and severe morbidity. He said many of the women who almost die from preventable medical complications during pregnancy likely incur short- and long-term medical setbacks, as well as high hospital costs. He said that’s why it’s important to focus on severe maternal mortality as well as maternal deaths. "It’s a good barometer of ... how well our moms are doing," he said. Texas has a thing about being number one. But when it comes to the state of Texans' health, it ranks below the middle of the pack, and it's falling. The United Health Foundation ranked Texas 34th in the country in its 2017 annual report. But there's something that could help: this year's Healthier Texas Summit kicks off in Austin on Oct. 25; it's a conference about how everyday people can achieve healthier outcomes in their own community. Dr. David Lakey is vice chancellor for health affairs at the University of Texas System, and is also an organizer of the event. Lakey says while the overall focus of the summit is how to improve health within our communities, there's also a focus on health policy in the upcoming legislative session.